Fans of Regis Philbin's morning TV show know that each day they make a call to a randomly chosen viewer. The viewer is asked a trivia question, and wins a prize if he gets the answer right. A few years ago, I got to be the "trivia caller" one day! This was back in the days before Kelly Ripa, when Regis' co-host was Kathie Lee Gifford. On this particular day, Regis was on vacation and Robin Leach of "Lifestyles of the Rich and Famous" was filling in for him. My conversation with Kathie Lee and Robin was really fun! Click here to listen to it! Sometimes they give away great prizes on the show, but this was NOT one of those days! The prize that day was a purse! It was so ugly that neither my wife or daughter would use it. For many years I was a professional radio announcer and disc jockey. My radio career included work in San Francisco and San Luis Obispo, California. In San Luis Obispo I was Program Director at KLZZ (known as "Class-101"). Here's a clip of what I sounded like on-the-air, from a New Years Day 1990 KLZZ broadcast during which I counted down the biggest hits from 1989. 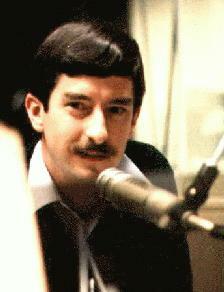 My first paying on-the-air job was in San Luis Obispo at KVEC, where I was a news announcer and disc jockey. My training came at the local college station, KCPR, where I also served as Program Director and won the "broadcaster of the year" award. I had some interesting experiences at KCPR... click here to read more about them. In San Francisco, I spoke as an in-studio guest on numerous occasions during the Lee Rodgers program on KGO. Lee and I discussed the latest innovations in consumer electronics. Looking back on it all, my luckiest break in radio was quite early in my career: landing a job at K101 in San Francisco when I was just an eager college radio amateur in 1976. I began as a flunky and gopher, and later got to actually run the controls in their main on-air studio. Pretty fun stuff for a college kid! 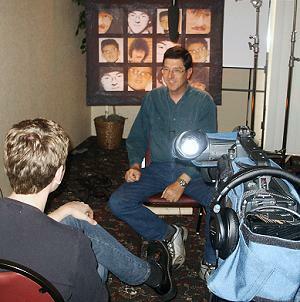 A few years ago I was interviewed by a video production crew for a show on VH1 about the early days of Weird Al Yankovic. Weird Al worked at Cal Poly's campus radio station when I was the Program Director there in 1977. (Read my college radio anecdotes here) In fact, Al recorded his first hit record in the bathroom across the hall from the radio station! In case you're not familiar with Weird Al, he is famous for doing parodies of popular songs. Six of his comedy albums have sold more than a million copies each. So, VH1 set out to interview many of the people that knew Weird Al in the early days. They had a hotel suite in San Luis Obispo which they turned in to a little TV studio, and I sat down and told them a few good Weird Al stories from his Cal Poly days. I managed to come up with a few lines that were good enough to make it in to the final production... they used three very short clips of what I had to say in the show, which was broadcast in late-July. Unfortunately, I don't have any audio or video clips of it for you to see here... I just wanted to share the story. There are a lot more audio and video clips posted on my YouTube channel. Check it out!